Home » About Us » Our Doctors » Robert M. Palacios, M.D. 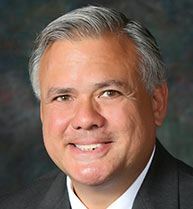 Dr. Robert Palacios is board-certified, and fellowship trained and has been specializing in outpatient orthopaedics and sports medicine for over two decades. Originally from New York City, Dr. Palacios received his medical degree from the Albert Einstein College of Medicine in New York and went on to complete a residency in family medicine. He subsequently pursued a fellowship in non-operative orthopaedics and sports medicine through Seton Hall University's graduate school program at St. Joseph Medical Center, in Paterson, NJ. Dr. Palacios has been a team physician for Montclair State University since 1992, and team physician for Seton Hall University since 2002. He is also the team physician for many high schools in the tri-county area, including Clifton High School, Butler High School, Pompton Lakes High School, West Milford High School, Kinnelon High School, and Passaic County Technical Institute. In addition, he is a member of the American College of Sports Medicine (ACSM), as well as the Medical Society of New Jersey (MSNJ) Committee. Dr. Palacios's accomplishments include being the recipient of the Medical Teacher of the Year award from the Mount Sinai School of Medicine. He has appeared on numerous major television networks. Currently, Dr. Palacios resides in New York with his wife Jannette, and their three sons. His interests include outdoor activities such as hiking, fishing, and mountain biking; as well as racquet sports.